For Ableman, who came into the project as a consultant and now acts as Managing Director, the city farm is a social catalyst and its sustainability lies in its larger social mission. “Our experience has proven giving people a reason to get out of bed each day, meaningful employment, a place for people to come to learn new skills, a community that depends on them […]. Really it’s been the people of that community that in many ways helped themselves,” says Ableman. “We provided the setting for it to happen.” A study by Queens University in 2013 calculated that for every dollar Street Farms pays a member of staff, it creates a $2.20 savings to local health, social and legal services. Street Farms employees grow their fresh produce in custom built growing boxes. As the farm reduces to a skeleton crew in the winter months, Ableman sees the boxes as a way to keep folks employed and meeting their recovery goals. “The boxes address a number of problems. They address short-term leases, they address contaminated soil…if you have to move at short notice…. We get more requests for the boxes than the produce growing in them. We’re looking at trying to find a warehouse. Our idea would be to start manufacturing and distributing them within the next year,” says Ableman. This value added product must be cost effective and currently Ableman and his team are working on how to reduce the per unit cost to make them both affordable to buy and reasonable to make. 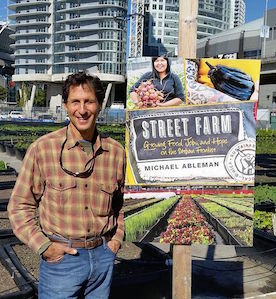 With over 40 years of farming experience and deep roots in the sustainable city farming movement that stretch back to the 1980s, Ableman hopes that his project in Vancouver will encourage more social enterprise-focused urban farms and for growers to realize that in today’s social and economic climate, profit as priority is old hat.